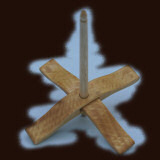 As with my Drop Spindles IST Crafts Turkish Spindles are lovingly hand made from selected hard woods. 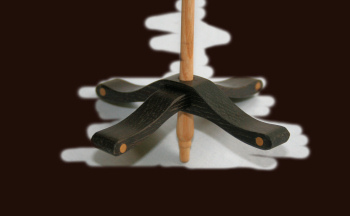 With a design that is unique to IST Crafts they offer a very attractive spindle that will just keep spinning. The heart of any Drop Spindle is the shaft. In order to provide stable yet attractive shafts, I have selected English Ash for the Turkish shafts. All my timber is hand selected but I take particular care over my ‘shaft wood’, looking for straight close grained timber. The timber is bought killed dried and then further seasoned in my timber store. It is then cut into billets and furthered seasoned. This additional seasoning ensures a stable and straight shaft. 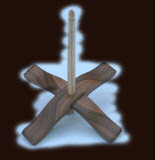 Each shaft is finely hand turned from the acorn bottom finial to the gentle taper of the main shaft. Particular attention is given to the joint to ensure each shaft fits securely to the cross members so ensuring the spindle spins true. The length of the shafts varies depending on the size of the spindle. Please note: the width given is at the topside of the cross members and the length is the total length of the shaft. The lengths may vary by a small amount as they are individually hand turned. I have hand select all of the timber for my Turkish spindles from a supplier that specialises in woods for Musical instrument. The wood is therefore of top quality and selected for its beauty. The Cross members are hand made in selected pairs ensuring the wood matches and they form a sung fit that assembles and disassembles smoothly. All my Turkish spindles are wrapped in acid free tissue, bubble wrap and shipped in their own individual post tube which provide a safe shipping container (see P&P on welcome page). To offer an additional benefit to my customer I offer a range of attractive colours. When shipped these are wrapped in brown parcel paper so the tubes may be kept. These then provide an attractive and safe means of travelling with your spindle to Guild and Ravelry meetings. Colours available are Gold, Silver, Red and Blue, please select your preference when ordering. All my spindles are shipped in their own individual post tube lined with CFC free foam to provide a safe shipping container (see P&P on welcome page). To offer an additional benefit to my customer I offer a range of attractive colours. When shipped these are wrapped in brown parcel paper so the tubes may be kept. These then provide an attractive and safe means of travelling with your spindle to Guild and Ravelry meetings. Colours available are Gold, Silver, Red and Blue, please select your preference when ordering. Due to the unique design of my Turkish spindles I am able to offer the lighter woods with small Brass weights in the ends of the arms. 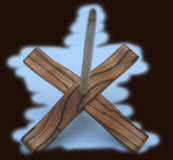 This adds several grams to the extremities of the cross members producing a very long even spin. A lovely lemon yellow with a silky sheen. A deep red example of this wood. This rare and beautiful wood is normally used for making violin bows. The selection of wood I have is all figured, but due to it scarcity I am unable to offer the 130 size. However the wood is very dense so the weight will be towards the top end of the range. A deep purple example of this wood. This wood does vary in colour from almost orange with darker stripes to very dark! I do have some with some sap wood which is almost white and make a nice contracts, if you would like one made with this please e-mail me. Sourced from the East Anglian fenland basin this stock of Bog Oak has been carbon dated to 3,300 BC so is in excess of 5000 years old. Logs are excavated from a sunken forest caused by a rise in sea level that started about 7,000 years ago. The selection of Satinwood I have is very pretty showing an almost ?quilted? effect.